Hyperextension injury of the elbow occurs when the elbow is bent backwards beyond its normal range of motion which results in damage to the ligaments, bones and other structures of the elbow. Many injuries happen during strenuous physical activity such as sports. Another common cause is when we catch ourselves on an outstretched arm when we fall which in turn can cause the elbow to bend the wrong way due to the impact and our body weight. 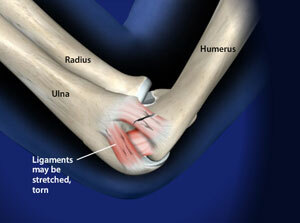 Instant pain, muscle spasm, swelling and loss of strength in the arm are common symptoms of this injury. In severe cases, the elbow may be deformed or the hand circulation may be affected. Immediate treatment options include ice or cold therapy and compression to reduce swelling and pain. Rest and immobilization of the elbow joint in a brace may be necessary. In severe cases, surgery may be required if structures to the elbow joint have been completely torn, fractured, or severely injured. If you are experiencing Elbow pain, weakness of the Elbow, stiffness of the Elbow or night time Elbow pain, give us a call 972-250-5700 or make an appointment now.